You need to keep track of both water supply lines and drainage pipes. What's the Difference Between Supply Lines and Drainage Lines? Supply lines are the pipes or tubing that provide hot and cold water to your faucet, toilet, washer, and your refrigerator if you have an ice maker. This includes the water main feed from the city or well and well pump. Drainage flows away from sinks, toilets, and clothes washers and feeds to sewer or septic systems. Drainage is normally not a problem with properly pitched pipes and no section of pipe exposed in a frozen crawl space. (The water should flow through and not stop where it can freeze.) 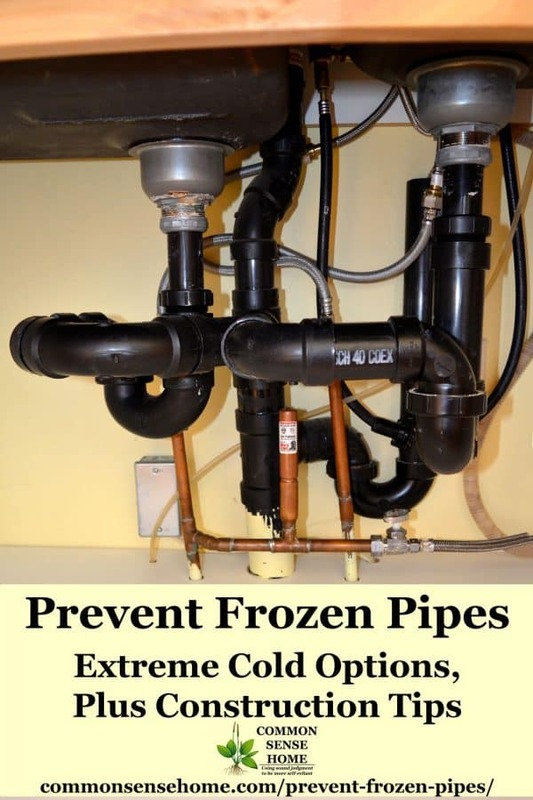 The most likely spot for frozen pipes is where there is the trap that holds water to block sewer gases. You find these under a toilet or sink. The trap on a standard toilet is protected in the body of the toilet, but sink traps are often on exterior walls. If you have a septic system, it's important to prevent freezing the tank and septic field. Exterior walls. Supply lines and drainage on exterior walls are the first place to check. Keep cabinet doors open overnight on extremely cold days so room heat reaches the pipes. Leave faucets dripping to keep water moving. Moving water is less likely to freeze than still water. Crawl spaces. 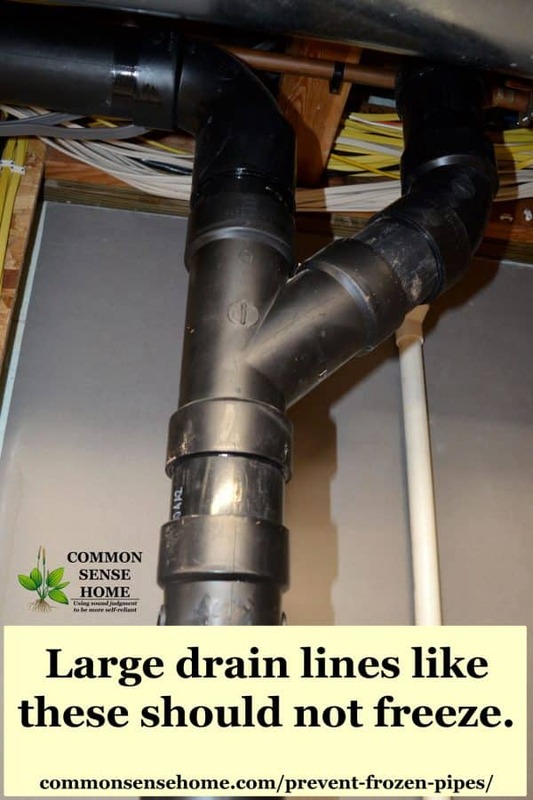 Exposed pipes in crawl spaces or other unheated areas are a freeze risk. Insulate unheated areas and block cold air infiltration. If you live in an area where cold winters are normal, consider pipe wrap heating to keep pipes from freezing. Exterior Faucets. Make sure all exterior faucets are off and drained. Many modern outdoor faucets have self-draining feature. Check with a plumber if you're not sure what type of faucet you have. Exterior faucets may have shut off inside the house for extra protection. Washing machines on a porch or in an unheated garage could require temporary space heaters to prevent freezing. Never use an extension cord with space heaters, and make sure you leave 3 feet of space from all flammable materials. Shut Off Valve. Know where your house water shut off valve is located. Water expands when it freezes. In a drain, this plugs the drain. In a supply line, it can split the pipe. When the pipe warms up, the water runs until the leak is fixed or the water is shut off. This may cause thousands of dollars in damage. Don't Turn the Temp too Low in Areas with Plumbing. When leaving the house or going out of town, don't set the thermostat below 55 degrees. Pipe insulation is a good first step to protect your pipes. Foam pipe wrap insulation comes in different thicknesses sized for different pipe diameters. Always cut the corners with a 45 degree cut, and tape or zip tie them to keep them tight. There is also fiberglass insulation with a plastic backing that comes in 6 inch wide strips. Use this wrapped directly around the pipe, or over foam insulation for extra protection. Heat tape is electrical heating cord or tape that is wrapped around pipes. The electrical resistance heat warms the pipes. It takes time to properly install heat tape, so do this as part of preventive maintenance, not during the heating season. Always follow the manufacturer's installation instructions. Most heat tapes have built in thermostats that only call for heat if the temp drops too low, but they do use a fair amount of electricity. Use heat tapes in unheated areas combined with lots of insulation to make them efficient. Always use heat tapes with the recommended type of insulation. Circulating pumps such as the Taco 1/25HP pump, move water to keep it from freezing. They work in combination with a thermostat to keep water from the water heater moving through the lines for instant hot water at the faucet, but can also be used to run warm water in a line parallel to a supply line inside insulation to prevent freezing. Install circulating pumps during construction or major remodeling, as they require plumbing and electrical runs. Circulating pumps can be used to protect underground exterior water lines, but keeping those pipes below the frost line is a better option. If you're stuck with bedrock and cant't go deeper, a circulating pump might be the answer. Failing to plan is planning to fail. Take the time to talk to your plumber to understand what is going into the construction of your home or your remodeling project. 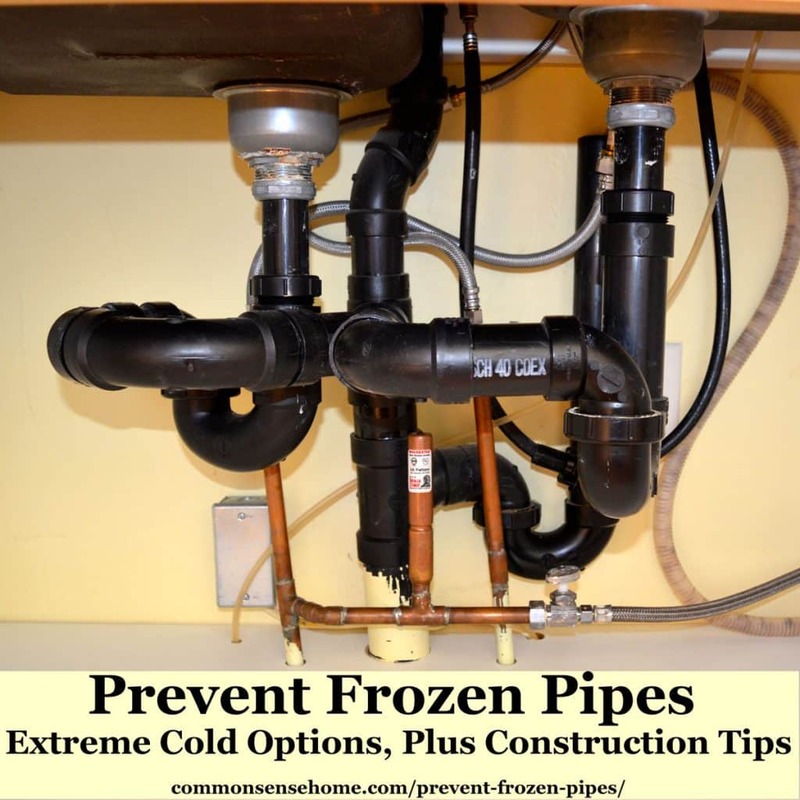 Whether the contractor uses PEX tubing or copper, water feed lines can freeze. Even if you live in Florida, Arizona, Texas or other warm area, insulate all plumbing. Insulation is MUCH cheaper than cleanup and re-installation of burst pipes. If possible, place plumbing in interior walls. If you have to put plumbing in exterior walls, ensure at least 4″ of insulation (preferably foam) between the exterior wall and the plumbing. Ensure water feeds or well feeds are at least 4ft below ground. Lower is better. 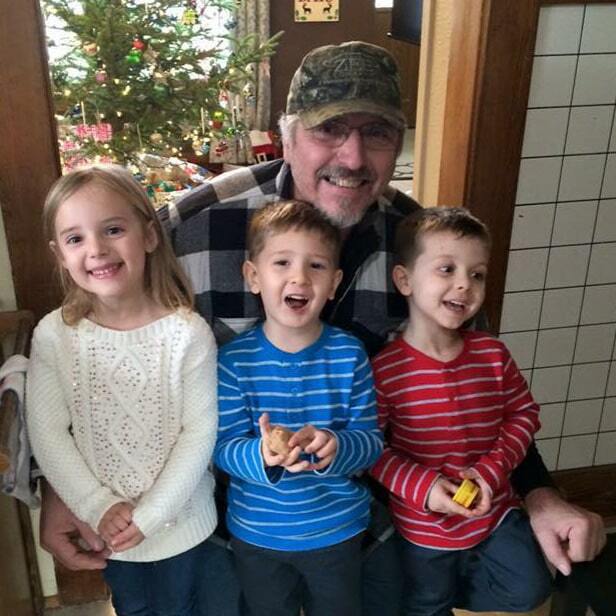 Include heavy insulation in any crawl spaces or small areas that plumbing runs through. Insulate exterior walls completely. Consider 1/2″ pick foam board or spray foam on the exterior wall before the siding is applied. Walls can be 2×6 or two 2×4 offset to allow for extra insulation and no thermal pass-through. ICF (Insulated Concrete Forms) provide good insulation and durability. Add Tyvek wrap or a similar product. Air sealing your house to minimize drafts will not only prevent pipes from freezing, but will make your house more efficient and comfortable. 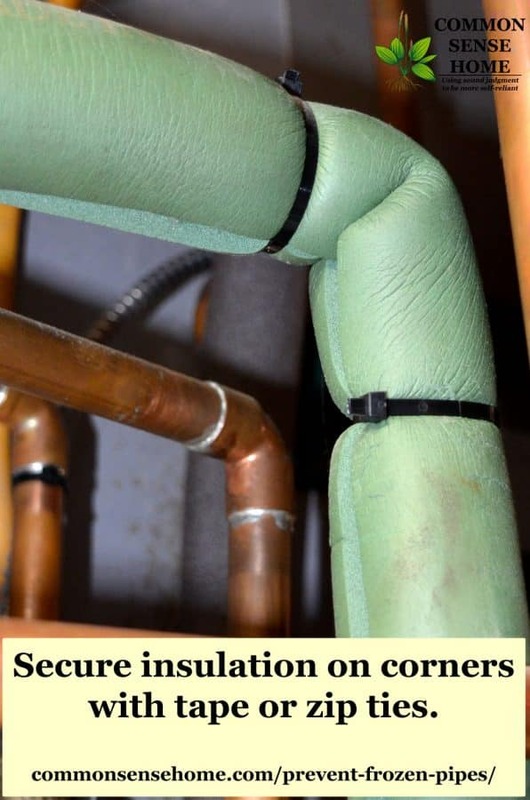 Use pipe insulation. There are long insulation tubes created just to insulate lines. If you are in extremely cold areas, Permanently add heat tape while walls are open. If they are on/off you can have the electrician add a switch, if they are automatic you don't need to do anything. Either way, planning for the heat tape, ensures you have power where you need it during construction. This is a good idea for exterior walls and crawl spaces. Install circulation loops that keep water flowing. Add valves that allow you to shut off the water and drain high frost risk areas like garage plumbing.